Cross-Link group at NASA (Courtesy of Katie Gu). A group of Stanford and Brown students have collaborated on a new platform, Cross-Link, which aims to make scientific research more accessible to journalists and the general public. The site connects researchers to scientific journalists to publicize recent discoveries and breakthroughs. According to cofounder Katie Gu ’18, the Cross-Link team’s goal is to connect scholars with communicators by developing a network of writers with interests in certain academic fields, from psychology to biology to astrophysics. This allows Cross-Link to consolidate research in one place and bridge the gap between researchers and writers more efficiently. “Cross-Link creates a forum where journalists and freelance writers can interact with researchers who want to have their work available to a wider audience,” Gu said. Currently, the project is currently in its early stages — the founders have reached out to news organizations such as Stanford News and the San Jose Mercury News in search of journalists and created a page on their website where researchers can submit abstracts about their work. The website is one of the Stanford-Brown team’s projects for the International Genetically Engineered Machine (iGEM) Competition, a synthetic biology competition that attracts entries from around the world. Cross-Link is a project under the “Human Practices” section of the competition, which challenges teams to reimagine their summer work to explore related topics in social and environmental contexts. Gu likened the work from Cross-Link to the collaboration between Raj Chetty, an economics professor at Stanford and David Leonhardt, a New York Times staff writer. According to Gu, the articles on economic mobility at elite colleges produced during their project helped to popularize Chetty’s work among the New York Times’ wider readership. 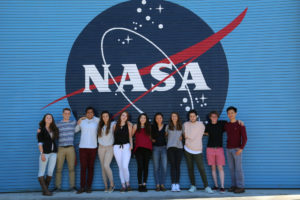 In addition to Cross-Link, the team worked out of the NASA Ames Research Center to develop science-focused projects for the iGEM competition over the summer. Other examples of their work include generating electricity from colonies of E. coli bacteria – a concept inspired by the structure of an electric eel – as well as synthesizing materials that repair themselves with glue-secreting bacteria. The page will be developed over the following months in preparation for the iGEM Jamboree in Boston from Nov. 9 to Nov. 13, where the Stanford-Brown team will compete against over 300 teams from across the world. Contact Sterling Alic at salic ‘at’ stanford.edu.